Saint Elizabeth Ann Seton was the foundress and first superior of the Sisters of Charity in the United States. She was born to Episcopalian parents into New York City high society on August 28, 1774. Her father, Dr. Richard Bayley was the first professor of anatomy at Columbia College and praised for his work as the health officer of the Port of New York. Her mother, Catherine Charlton, daughter of an Anglican minister of Staten Island, N.Y. died when Elizabeth was three years old, leaving her and two other young daughters. Elizabeth was married on January 25, 1794 in St. Paul's Episcopalian Church to William Magee Seton. William fell into financial troubles, and later died of tuberculosis in Pisa (Italy) in December 1803. After getting to know the Catholic Church in Italy, Elizabeth fasted and prayed for light. Finally, on Ash Wednesday, March 14, 1805, she was received into the Church. Her conversion unleashed a storm among her Protestant relatives and friends and made her financial strains even greater. 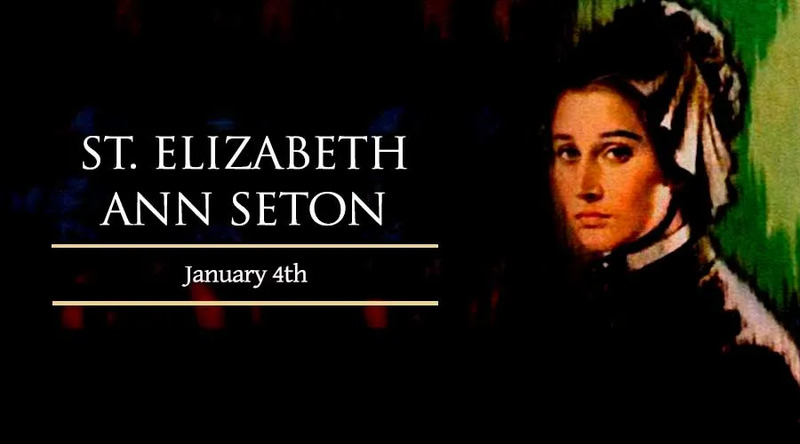 In January 1806, Cecilia Seton, Elizabeth's young sister-in-law, became very ill and begged to see the ostracized convert and told her of her desire to become a Catholic. When Cecilia's decision was known threats were made to have Mrs. Seton expelled from the state by the Legislature. On her recovery Cecilia fled to Elizabeth for refuge and was received into the Church. Elizabeth moved to Baltimore in 1808 and with the help of a Catholic convert, a farm was purchased two miles from Mt. St. Mary's College and Mrs. Seton took vows privately before Archbishop Carroll and her daughter Anna. In 1810, Bishop Flaget was commissioned to obtain in France the rules of the Sisters of Charity of St. Vincent de Paul. The rule, with some modifications, was approved by Archbishop Carroll in January 1812, and adopted. Mrs. Seton was elected superior against her will and in spite of the fact that she had also to care for her children. Many joined the community; including Mother Seton's daughter, Anna, who died during her novitiate (March 12, 1812), but had been permitted to pronounce her vows on her deathbed. Mother Seton and eighteen sisters made their vows on July 19, 1813. The third time she was elected superior in 1819, she protested that it was the "election of the dead," but she lived for two years more, finally succuming to a pulmonary infection. She died in Emmitsburg, Maryland on January 4, 1821. In 1880 Cardinal Gibbons (then Archbishop) urged the steps be taken toward her canonization. Elizabeth Ann Seton was beatified in 1963 and she was canonized on September 14, 1975.